Check out our list of NYC massage parlors. 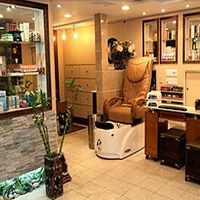 If you are looking for a great place to relax and unwind to get all those knots out, view our complete guide to massage parlors in NYC! Treat Yourself with Beautiful Skin! Everybody dreams of having perfect skin. Skin Spa specialists make it happen using cutting-edge technology and professional products. Expert estheticians turn back the time and transform your skin. Everything is possible when you have such great aids: latest laser technology and professional products like PCA Skin, GLO Therapeutics or Peter Thomas Roth. Forget about wrinkles, age spots, skin laxity or unwanted hair! Make your appointment online and save money! You should also check the special offers section; it's full of great surprises! Skin Spa has 7 locations in New York, all conveniently placed. Mario Badescu Skin Care products and treatments are the result of many years of research made by the late Romanian-born chemist and cosmetologist Mario Badescu. His skin treatments are considered the best in New York City and have been used by famous actors and actresses (you may see the list on the website) for over 40 years. Healthy, beautiful and luscious skin was Mario's dream. All facials are executed by skin experts. The products prevent and also treat skin problems, like acne and excess oil. Free shipping and samples available for online orders over $50. Oriental flavour and an American city! What do you appreciate more in a spa? A beautiful view, a great decor, modern equipments, natural products, or a harmonious atmosphere? At Mandarin Oriental Spa you have them all! Spectacular view over New York City's skyline, top-notch fitness center, tailored spa programs with signature products developed by the award-winning UK company Aromatherapy Associates and Tibetan cymbals which will make you relax and feel the joy of living a healthy life. Open 7 days a week from 9am - 9 pm, Mandarin Oriental Spa awaits you 45 minutes before your appointment to enjoy the heat and water facilities. The Place to go to When your Body Needs a Workout without any Effort! Need to lose weight, detoxify or stop the pain in your muscles? 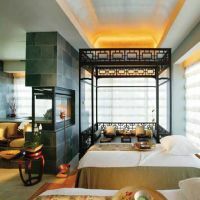 Season Spa offers slimming treatments and massages in a friendly atmosphere, right in the heart of Chinatown. The prices are reasonable and the spa menu is varied. Whether you are looking for a permanent makeup, a spa manicure or pedicure, a hand treatment, an acne skin treatment, a hot stone massage or a anti-cellulite treatment, you are in the right place! Open 7 days a week from 10am - 8pm. Reservations by phone. Beauty as we know it! Bliss Spa 49 NYC is part of a worldwide network of spa salons renowned for their skincare products and services. They pride themselves with the best technicians in the world that develop their own products. They constantly search for solutions in wrinkle reduction, fat loss and skin cleansing. What is great about Bliss is that they don't just treat the effects, they are looking for the source of your skin problems. They encourage a healthy living and for that they developed a unique detox diet that will help you regenerate your body and begin a new life. Working hours: 8am - 10pm every day of the week. Please note there is a different phone line for group appointments. Cowshed Spa is centered around the English natural, organic and environment friendly Cowshed products, with an established tradition of 15 years. Their entire philosophy is based on the benefits of the nature. So come enjoy the miraculous power of plants and their essential oils! Problems with your back? Cowshed therapists will make your pain go away using special technique massages. 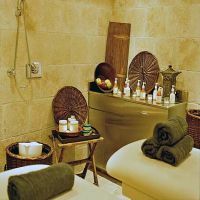 Hands, feet and face will be rejuvenated with advanced spa treatments which will make you shine! Cowshed products are also available for sale at the Soho House reception. Pretty parties can be held here if you want to enjoy a full pampering experience accompanied by great food and even better wine. Korean Rejuvenation Blended with European Sophistication! 20 tons of semi-precious stones are found at the Juvenex Spa, in the form of Jade Igloo Sauna, the rock star of this sophisticated spa. Seaweed and mud treatments for your body, face and hair are prepared by specialists here just to make sure you not only look good, but you also feel good when you leave. 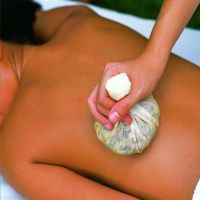 All treatments are inspired by Asian and European remedies. Reflexology, accupressure, shiatsu, mosht-o-maul massages will make your body free of all tension and in harmony with your mind. Water therapies will enhance your healing and your beautification. Multiple membership advantages are available. Achieve Spiritual Balance Through Water Cure! Health is the main concern here at Great Jones Spa in NYC. A healthy person is a beautiful person, and this is why everything here is centered around the healing of the mind and the body together. Water therapy is used in the process, in the most fascinating way - you are welcomed in the middle of a 3 story waterfall which surrounds a unique wet lounge. The 15.000 square foot retreat is inspired by the Roman Caracalla Baths, where water was the ultimate rejuvenation treatment. Detoxify and invigorate your body in the River Rock Sauna, Chakra Light Steam Room, Thermal Hot Tub, and Cold Plunge. After that, enjoy top-notch spa services for your face and body. For couples looking to spend some quality time, there is a private deluxe room which can be rented. Treatments for all: singles, couples, and future mommies! 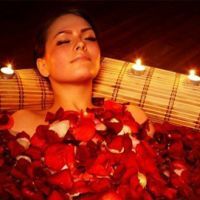 Silk Day Spa in NYC is the place to go if you want to try different types of massages: hot stone massage, reflexology, shiatsu, lavender luminescence massage, swedish, thai, sports massage. The special silk packages are uniquely crafted for every need: Mommy Delight for pregnant ladies who want to be happy and beautiful, Mother and Daughter Celebration for a stronger bond between the two and many others. You shouldn't miss the Sugar Pie, which will not bring you extra pounds, but extra beauty! Gift cards are available to order online with free shipping, if you want to make somebody happy. An Oasis of Calmness in Busy NYC! Open 7 days (including holidays), from 9am – 10pm, Eden Day Spa is your best choice if you are looking for quality services with quality products, all natural. Escape New York City’s hussle and bussle and enter an oasis of calmness with beautiful scents and aromas. One unique service provided by the Eden Day Spa in NYC is Ear Candling, which everyone can use for a better hearing and for sinus and ear canal relief. Another one is the Back Facial, a skin treatment which will make your back look fantastic, reducing clogged pores and other skin problems! Suitable for both men and women. Euphoria Spa in NYC is an experience for all – adults, children, teens. The specialists here are well trained in Chinese Medicine methods and cater every need, be it pure relaxation or skin conditions. Open M, W, TH, FR 10 – 8, T 1 – 8, SAT 10 – 7, SUN – closed. Online booking is possible with credit card. They also have a great loyalty policy – check it out!.